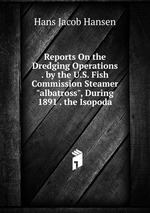 Аннотация к книге "Reports On the Dredging Operations . by the U.S. Fish Commission Steamer "albatross", During 1891 . the Isopoda"